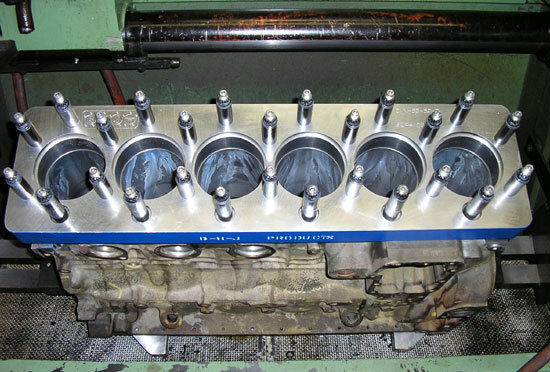 Ours may be the only engine shop in the area that offers torque plate honing of Cummins diesel engine blocks. You can't afford not to torque plate hone your block. It produces the best ring seal possible and therefore makes more power. We installed studs in this block which required drilling and tapping for the larger diameter studs. They distort the block differently than the factory bolts, so torque plate honing is a must. Note the spacers used to mimic the amount of thread engagement when the head is installed and therefore recreate the stresses as closely as possible. If you hone your Cummins diesel block without a torque plate, you are definitely missing some power gains.